Decorate your home, and eliminate stinky odors all at once. This elegant looking lamp provides colorful illumination to set the mood, but it also allows you to heat oils and scented wax in a dish at the top. Use the dial to set the intensity that you prefer, and as the fragrant liquid or solid tart is heated, the scent will diffuse into the air. You'll be able to eliminate unwanted smells in a safe and natural way, but you'll also have a subtle lighting effect that will enhance the look of any room you place it in. It comes complete with a long lasting halogen bulb, and it operates on electricity, so just plug it in to any standard outlet to complete the setup process. This model features a solid wood base with a dark finish, and simple, decorative styling. 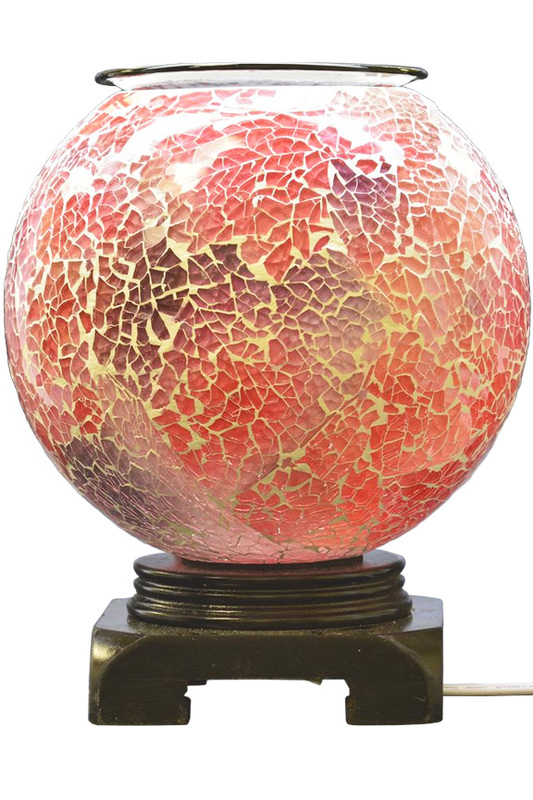 On top of the sturdy base, a glass globe is permanently mounted to ensure a solid design. 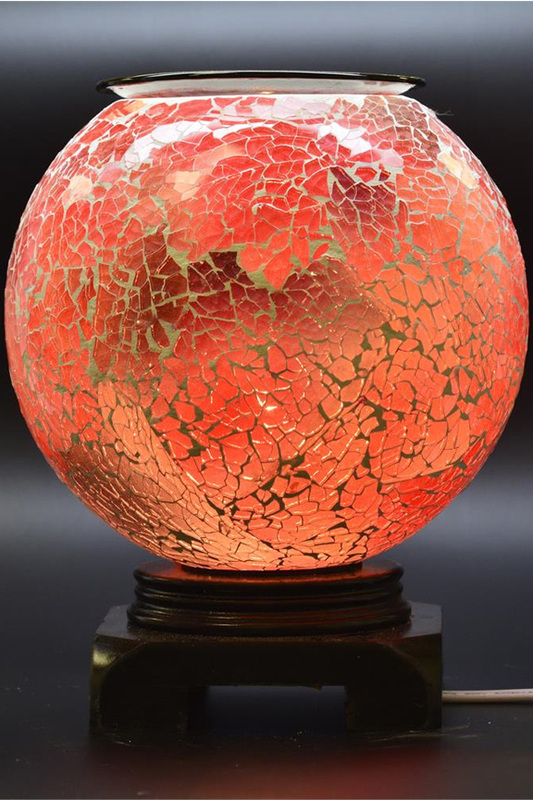 A glass mosaic in shades of pink completely covers the exterior of the globe to give it a great look, even when turned off. 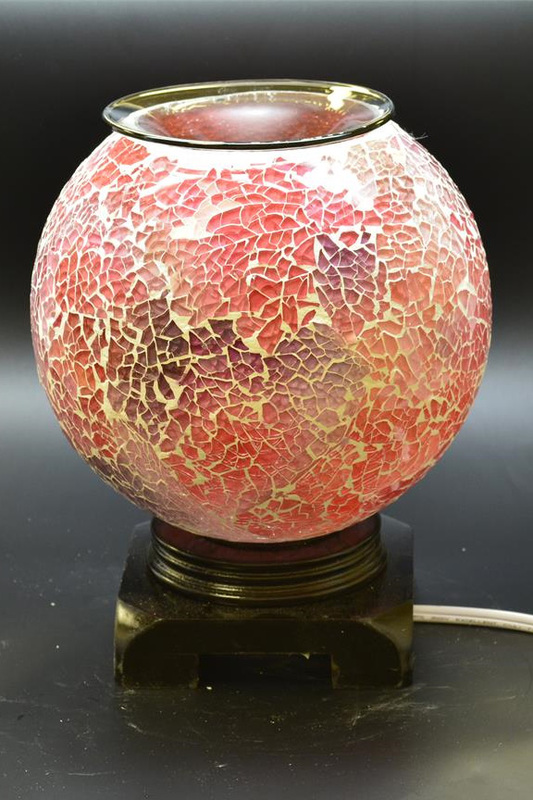 Once you switch it on, the warm glow at the center shines through the fractured glass to illuminate in rich shades of deep pink, red and purple. Add essential oil, regular fragrance oil, or even solid wax tarts to the dish at the top, and once they heat, the scent will begin to fill the room. Electric Operation - Easy to use, and consistent heat that remains adequate at all times, you'll never have to worry about flames that blow out, or candles and fuel that runs out with this model. Just plug into any standard outlet to power it. Natural Deodorizer - Instead of aerosol sprays and other chemical filled options, you can use this attractive product to make any room smell better. The natural action is much safer when compared to off-the-shelf deodorizers. Top Quality - Made from thick glass and solid wood, this lamp and diffuser looks high quality, and with top of the line electronics, it is easy to operate, and provides many years of daily use. Fully Adjustable - With a variable control right on the cord, you can easily set the light and heat intensity that is ideal. You have a wide range to select from, so set to low for soft light and light scent, or crank it up to high for a more vibrant glow and intense disbursement of fragrance. Easy Maintenance - Although the bulb included will last a long time, other models make changing the bulb difficult. The design of this model makes replacement quick and easy when it becomes necessary. 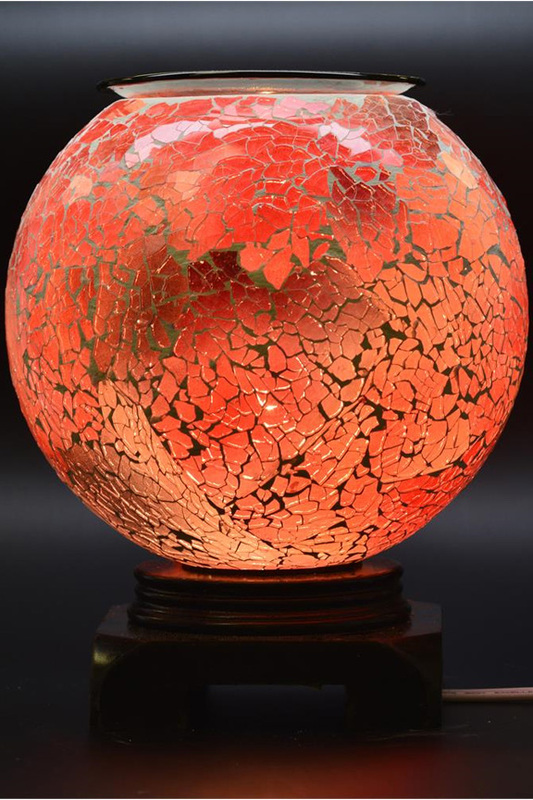 Multi-Use - Doubles as a nightlight or decorative lamp and a fragrance diffuser or oil warmer. Clean Fragrance - Unlike candles and incense that need to burn, this will not result in smoke or fire, so your air will not be filled with unwanted substances. Uses Use to add colored lighting in any room, or use to diffuse fragrance to deodorize naturally. Controllable Yes. Set the temp at any point from high to low for the perfect intensity. A beautiful addition to any home or office setting. The elegant lamp adds visual appeal, but it also safely scents the air by warming oil or wax at the top. Order Yours Today!